From left: Sven Cal Bayang, Selene McGriff. Background: The Strike Noir Gundam. That mech streaking across the image: The titular Stargazer Gundam. Mobile Suit Gundam SEED CE.73: Stargazer is a three episode ONAnote "Original Net Animation"  Stargazer was originally released online, rather than on TV or DVD. This was a bigger deal when it was released back in 2006 than it is now. set in Gundam franchise's Cosmic Era timeline. Taking place during the first months of the Second Alliance-PLANT War, and with regular flashbacks to the events of the First Alliance-PLANT War, it shows some of the wider implications of the war, and the people that it affected, soldier and civilian alike. The series was broken into three fifteen minute episodes, and followed two distinct plot threads. In the first episode, Project: Stargazer scientist Selene McGriff and her colleagues try to evacuate from Earth to their orbital space station, as the first clashes between Coordinator terrorists, Blue Cosmos fanatics, and their masters in ZAFT and the EA begin rocking the planet. The second episode introduces us to Sven Cal Bayan, a ruthless child soldier raised by Blue Cosmos to fight for the EA. Sven and his teammates Shams Couza and Myudi Holcroft undertake a number of missions for the EA, growing steadily more unbalanced along the way. In the third episode, Selene and Sven's worlds collide with a vengeance when he and an EA task force are dispatched to capture the Stargazer, an experimental mobile suit that Selene has been developing for deep space exploration. 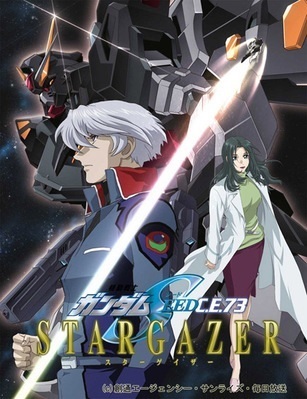 Released to decent reviews in the summer of 2006, Stargazer was never translated into English, though it has been subtitled. Ace Custom: The Strike Noir, Blu Duel, and Verde Buster were originally rebuilt Strike, Duel, and Buster units converted to suit their pilots' combat preferences. Action Girl: Selene proves herself one of the best that the CE verse has to offer when she defeats Sven in single combat. With a mobile suit not even designed for combat note The Stargazer was designed with space exploration in mind. And thus, is not armed with any onboard weapons (though it can use the DSSD Astray's Beam Pistols) , no less. Badass Normal: The first CE series to revolve around them, with Sven, Shams, and Myudi all being unaugmented humans, albeit ones who have gone through Training from Hell. We also meet Edmond Du Clos, a Natural who manages to take out a ZAFT Mecha-Mook using only his tank. Bald of Evil: Sven' Commanding Officer doesn't have any hair and is evil. Big Bad: The EA as a whole serves as one for the story, giving Sven his orders and targetting Selene and her project for destruction. Bittersweet Ending/Downer Ending: Depending upon whether you think Sven and Selene survived. Either way, the space station is in ruins and a whole lot of people are dead. The manga adaptation shows that both Sven and Selene survived, who were found alive by Sol not long after the OVA cut off. The Cameo: Has cameos from Muruta Azrael, Sting Oakley, Stella Loussier, Neo Roanoke, and The Destroy. Child Soldiers: The GINN Insurgent type shown in part 1 is piloted by three of them, who were helped by Patrick Zala-aligned ZAFT forces. Blue Cosmos trains entire units of them as an alternative to the Extended program, with them being personally overseen by it's leader Muruta Azrael (as shown in a flashback). Dark Is Evil: The black Strike Noir, which in contrast to the red, white and blue Strike (flown by Kira and then La Flaga), and the pink and white Strike Rouge (flown by Cagali), is piloted by Sven. Downer Beginning: The series begin with the fall of Junius 7 seen in Mobile Suit Gundam SEED Destiny. We see in detail cities being destroyed by falling debris and tsunamis wiping out everything. Next scene, we deal with the aftermath as authorities are scrambling to rescue any survivors and refugees trying to find shelter. Then, things get much worse when a GINN start shooting at survivors. During the War: The action that Sven and his team are involved in takes place behind the scenes or just to the side of the major events of the Second Bloody Valentine War. Elite Mooks: The 105 Slaughter Daggers that accompany the Strike Noir and Verde Buster are this in comparison to the more commonly seen Windam. Side materials show it can carry other Striker Packs that the Strike Noir can use. Their Slaughter moniker is not due to combat efficiency, though: they have foot vulcans designed to, well, slaughter infantry and annoying civilians alike. From ZAFT, we have the Kerberos BuCUE Hound, an upgraded close-quarters combat version of the standard BuCUE. Freudian Trio: Sven, Shams, and Myudi form one. Impulsive, sadistic Myudi is the Id, calm, easy going Shams the Ego, and cold-blooded, emotionless Sven the Superego. From Bad to Worse: Survivors of the gigantic tsunami have to run away from a GINN armed to the teeth. Greater-Scope Villain: Muruta Azrael and Lord Djibril. The former appears once in a flashback. The latter is only spoken of. Regardless, they're the ones who commissioned the supersoldier project in the first place, and set general EA policy, making them responsible for most of what is going on in the setting. Heroic Neutral: The researcher team that Selene belongs to had no interest in becoming involved in the war, and were working on research into deep space exploration. Blue Cosmos and the Atlantic Federation don't give them a choice, and eventually launch an attack on the station. When that happens, they show just how well they can defend themselves. Light Is Good: The titular Stargazer Gundam, a white and gray mobile suit that, while primarily built for deep-space exploration, can still use its energy absorption system to attack with beam rings that circle its body. It even has a halo! Names Given to Computers: While testing the GSX-401FW, L'ange decides that its "rude" to keep referring the the mobile suit's onboard A.I. as "401", so McGriff tells it that it's new name is "STARGAZER". It immediately changes its name on the command readouts. "GSX-401FW: I have learned I am STARGAZER"
Names to Run Away from Really Fast: The Slaughter Daggers. N.G.O. Superpower: Demonstrates the full power of Blue Cosmos better than any other entry in the CE 'verse, showing that they were able to set up fully staffed training facilities, complete with their own researchers, training staff and mobile suits. How much the Atlantic Federation government and EA as a whole helped isn't explained. No FEMA Response: Addressed after its absence in Mobile Suit Gundam SEED Destiny, the first episode begins with Earth Alliance launching humanitarian operations moments after the Colony Drop. Though the Coordinator Extremists caused mayhem over the entire operation. No One Could Survive That! : The manga adds an epilogue. Despite the tank being completely destroyed and claiming Edmund's life, the tank driver turn out to be alive and well. Primal Fear: Myudi's death manages to evoke both claustrophobia and being eaten alive. Red Oni, Blue Oni: Sven and Shams become this following Myudi's death and the latter's Sanity Slippage. Riddle for the Ages: Who was responsible for the terror attack that killed Sven's parents? It's never been revealed. Space Station: The space station where Selene McGriff and her research team are building the Stargazer. Taking You with Me: Selene uses the Stargazer to grab onto Sven's Strike Noir and have the space station launch them both into space. Theme Naming: Sol's name is related to the sun and Selene's name is often linked with the moon. Training from Hell: The program Sven attended was based around brutal physical exertion, brainwashing, and combat training, all designed to produce emotionally scarred, obedient soldiers. Tyke-Bomb: The program that produced Sven, Shams, and Myudi was another in a long line of Blue Cosmos/EA projects intended to create anti-Coordinator super soldiers. Unlike the various Extended projects, this one tried to do it without drugs. Villain Protagonist: Sven, Shams and Myudi are all bad, if sympathetic people, who are working for Blue Cosmos, the most unambiguously evil faction in the 'verse, if not the franchise as a whole. War Is Hell: By the end Sven's entire team is dead save for himself, the DSSD is all but wrecked, and Sven and Selene's chances of survival are narrow. Western Terrorists: Both Blue Cosmos itself, and the Zala faction radicals from the first episode.